Two great films which highlight all the delicious Hollywood stereotypes of Paris. First of all the hotel suite of William Holden is my dream apartment. Terrace with a view of the Eiffel tower and balcony bedroom in a heavenly grey, black and yellow decorated interior. The film has some great party scenes on the Eiffel tower and the french film studio is very swanky. 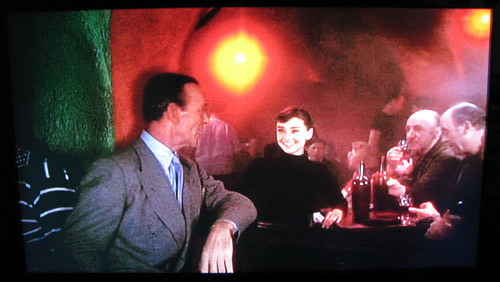 In “Funny Face” the perfect beatnik scene when Audrey arrives in Paris and goes directly to Montmartre. Fred Astaire arrives searching for her at a beatnik cafe and a girl gets slapped by her boyfriend, then falls into his arms in a classic “fais moi mal Johnny” cliche. Audrey discussing “Empathacism” with her new philosopher friends. Of course the club is in a “cave”. 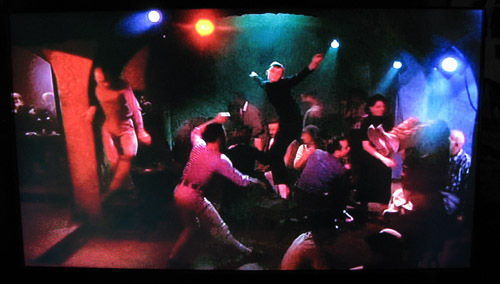 The most excellent beatnik dance number. Audrey in her black turtleneck, leggings and ballerinas is total 1950’s Parisian perfection.